Manchester is somewhere I've been passed through a hand full of times, but never actually spent any quality time there to explore, and make a weekend of it. Last weekend I had an event to attend in the area, so this seemed like the perfect opportunity to stay the night and see what Manchester had to offer! And with that, we were all booked into Novotel Manchester City Centre, and ready for the weekend ahead. 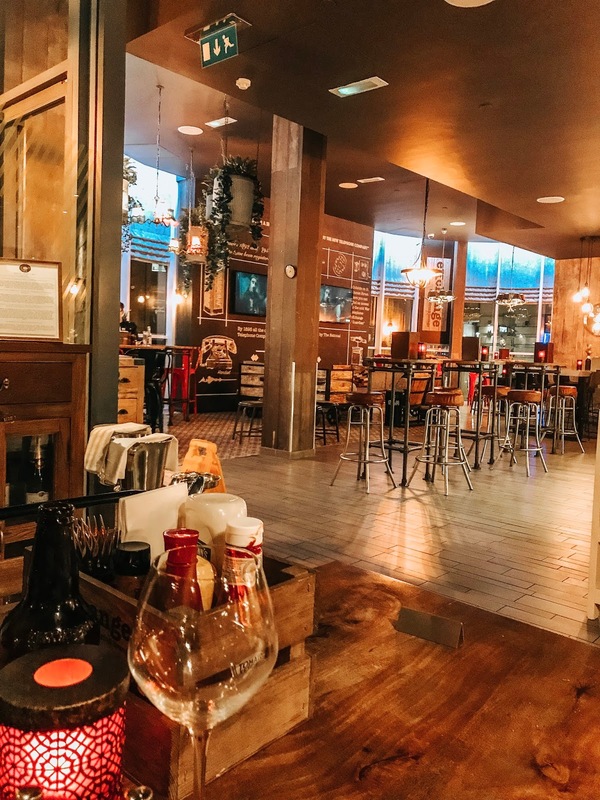 If you didn't already know there are actually two Novotels in Manchester, one is situated in the countryside village of Worseley, and the other is right in the heart of the city. With our event more central, it made sense to stay at Novotel Manchester City Centre. It's prime central location means it's perfect for exploring the city as you'll find many popular tourist attractions in the surrounding areas. Not to mention you're spoilt for choice when it comes to bars and restaurants! Immediately upon walking into the hotel entrance, I was blown away by how bright, modern and spacious the lobby was. The staff were so helpful, and couldn't have made my visit run anymore smoothly! The whole decor of the hotel is gorgeous, with artwork and maps covering the walls to add a more personal touch to Novotel Manchester. You'll find all you could possible need in this hotel with a bar and restaurant, fitness centre and there's even Golf, and Tennis facilities nearby! We were booked into a Standard Room which we were more than happy with. Inside you'll find a queen sized bed, sofa, desk area, and a very large tv, and of course free wifi. I have to say I had one of the BEST night's sleep I've ever had in this bed, the pillows are amazing! One of my favourite things about this room was the large windows, when you pull back the curtains it lets a lot of light in and really opens up the room, which I love. I was so surprised to find such a nice desk area in a Standard Room. 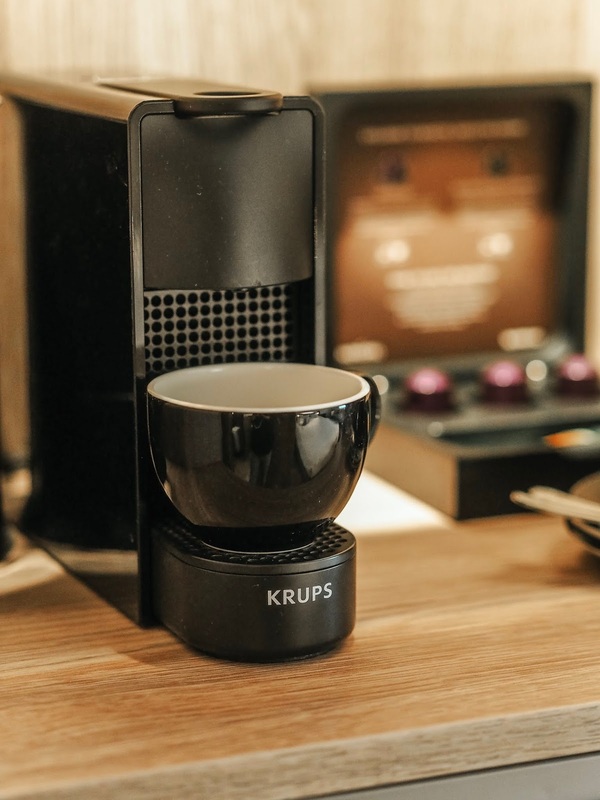 It's perfect for people like me who work on the go! To the right of the entrance you'll find the bathroom, which has a spacious rain shower. I was very impressed with how spacious the bathroom was, and with how many toiletries were provided. Not only did you get a fabulous range of fair trade beauty products, as well as your essentials such as combs, cotton pads etc, we were also provided with complimentary bathrobes and slippers! And to the left of the entrance, is where you'll find the wardrobe, as well as a safe, mini fridge stocked with water and milk, and your tea/coffee making facilities. Overall, our room totally exceeded my expectations and it is fantastic value for money. We also both really enjoyed our buffet breakfast the next morning which left us spoilt for choice. 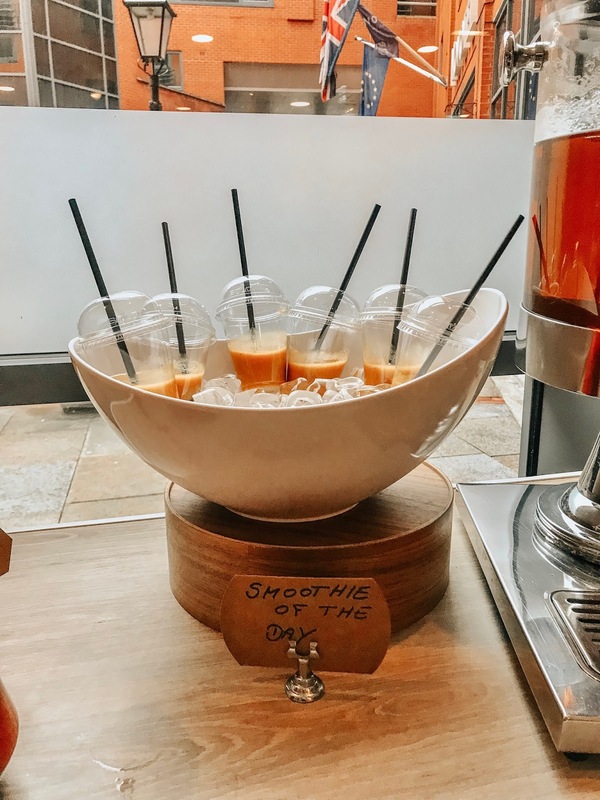 They even had a 'Smoothie of The Day' which I thought was an amazing idea! We were also booked into the Exchange Restaurant which is attached to the hotel. Don't worry though, if you're too tired and just want to eat in your room, room service is available. The restaurant felt very cosy and chilled out with the dimmed lights, and candles on each table. The staff were very attentive and reserved us a lovely little spot in the corner. 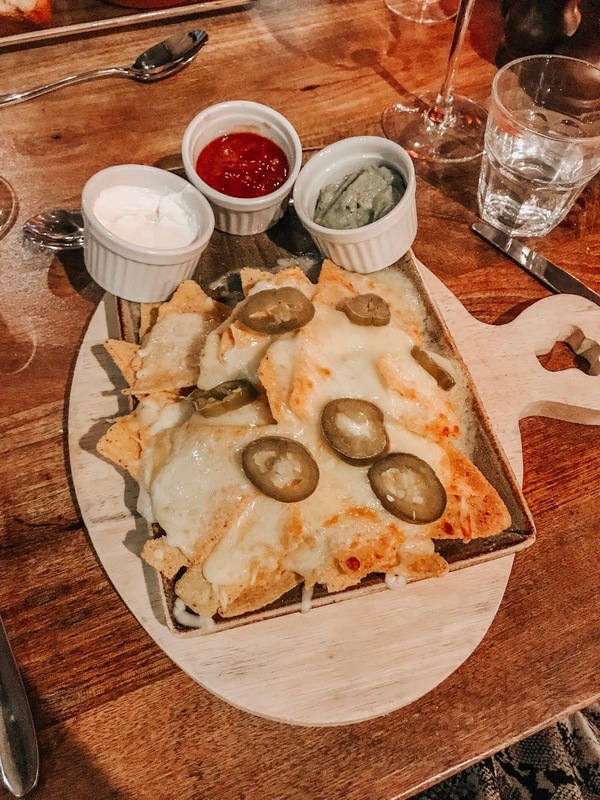 For starters, I went for the Nachos and cheese which came with a selection of dips which we could have honestly shared as the portion size is very generous. My boyfriend opted for the meatballs which he said were delicious, particularly the sauce! Moving onto mains, I went for good old fish and chips, which came with tartae sauce and mushy peas. And for my boyfriend's main he went for the Meat Pizza, which was topped with Pulled Pork, Pepperoni and Chicken! Once again, both dishes were absolutely delicious and cooked to perfection! 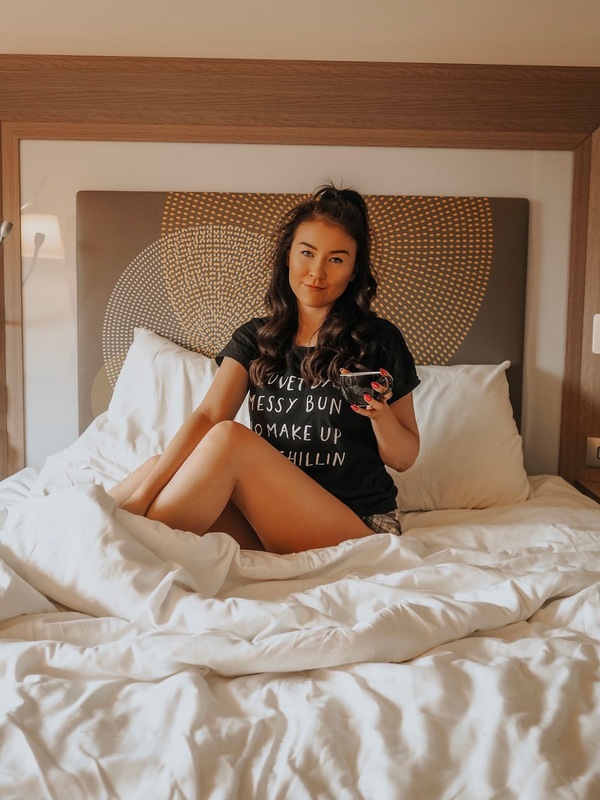 I really didn't know what to expect from this trip as I had never previously stayed with Novotel, but I have to say I was more than impressed and will definitely be staying with Novotel again in the future! Have you visited Manchester before? 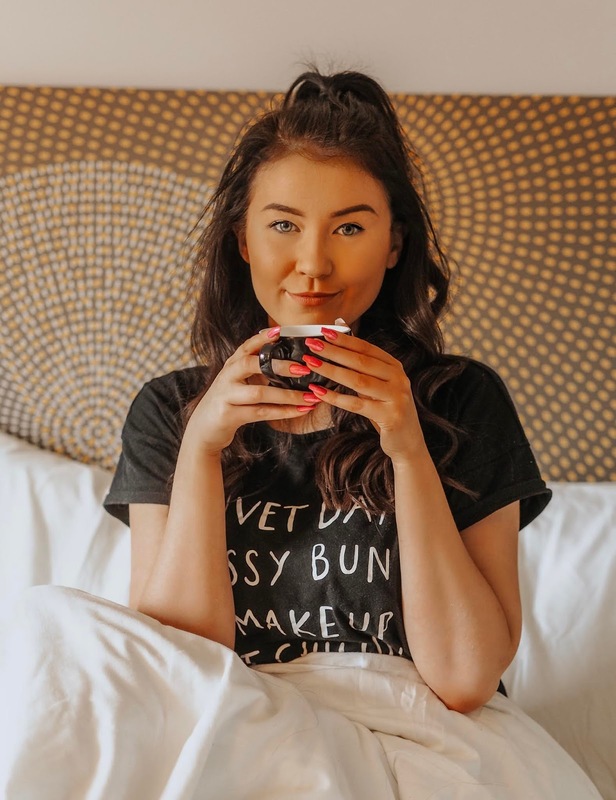 *AD - Our stay, and meals were gifted by Novotel Manchester City Centre. All words and opinions are my own. Please refer to my Disclaimer page for more info. Looks so fresh, well equipped, and creative! Love the style of that restaurant and the food looks so tasty. And that bed does look inviting! Oh wow it all looks SO good! Looks like such a good place to stay! Wow, this looks fab - I love the interior of the hotel lobby.